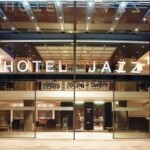 Hotel Jazz is a three star hotel located near Plaza Catalunya and Passeig de Gracia. It is a quite expensive three star hotel, due to its great location, great service and very nice interior and long list of services. A sun terrace is located on the roof together with a swimming pool, inside a very modern design can be found together with internet connection for all its visitors.